With 7 Stewart U25Bs either painted and lettered or earmarked for the Maine Central I had to do one as 232, the "Great Pumpkin" for its overall Harvest Gold paint scheme. 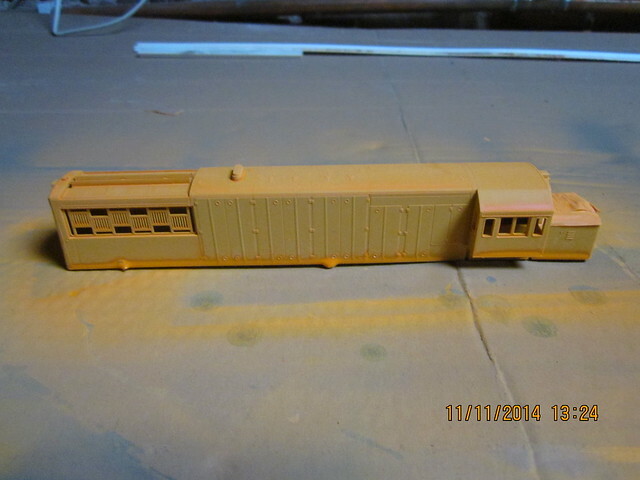 Another couple of passes should make it ready for its Pine Green short hood and subsequent detailing and decalling. keep us posted. FYI I edited your post. For pictures to show up from Flickr the best thing to do is to copy/paste the 'bbcode' , as I've done in your post. It's had another coat of Pumpkin, which has covered up the embarrassing runs at the bottom of the shell. I'm going to check it over and either give it a coat of Klear or tidy it up properly and give it a final, light coat then spray the horizontal section of the short hood. Once that's done it'll receive its decals then I'll sort out lighting (SMLEDs) and a decoder for its chassis. Koos, thanks for the tip about posting shots.